Silverlight Killed the HTML Web Site…or DID IT?! Silverlight, behind the daunting visage of spinning video buttons and deep zoom images, is a lover…not a fighter. While some bemoan the death of traditional web development in favour of Silverlight, the truth is that Silverlight itself wants to reach out and interact with HTML and its web site constructs. Do you want to witness the capability and potential that adding Silverlight to your new or existing website can bring? Do you want to understand Silverlight as an option in part to your web development, not an either/or proposition to a solution? Would you like to discover that Silverlight needs the web and how it can help make it better? 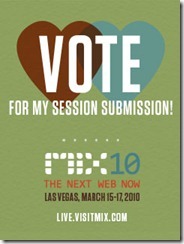 Well there’s only ONE WAY: To vote for my session at Mix 10! To vote, just click on the image below and on the webpage that loads click the “Add This Entry To My Ballot” link. Then browse the other list of submitted talks and vote for your favourites (you can submit up to five on a ballot).